I am from Southern Thailand, but I love to eat Isan food (Northeastern Thai food), I believe all Thai do. Northeastern Thai street vendors or restaurants are in every corner of Thailand. The food of Isan is very hot and flavored with pungent herbs and seasonings. The common Isan dishes you perhaps have tried or heard of are ส้มตำ Som Tam (Shredded green papaya, tomatoes, hot red chillies salad) , ลาบ Larb (Spicy Minced Meat Salad), น้ำตก Nam Dtok (a dish similar to Larb but using bite-size pieces of meat rather than minced meat) . The Isan dish is usually served with sticky rice (ข้าวเหนียว Kaao Niao) and a plate of fresh herbs and vegetables. Yesterday, I was craving for some spicy Isan cuisine so I headed to my favourite Isan restaurant in soi Sukhumvit 31 called บ้านอีสานเมืองยศ Baan E-San Muang Yos. I finished the usual orders and my stomach was not satisfied so I looked for more food in the menu. Then I saw ‘recommended dishes’ on a board on their wall, and one of them was ก้อยไข่มดแดง Koi Khai Mot Dang ( Spicy Raw Ant Eggs Salad). 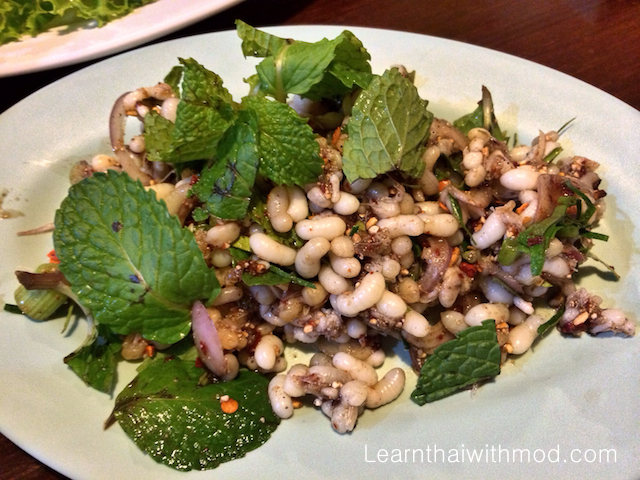 “ก้อย Koi is another similar dish to Larb, but using raw meat as the main ingredient. 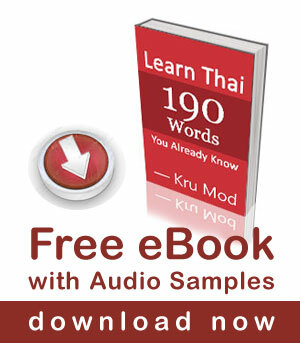 Ant eggs are common food for people in Thailand’s northeast. The eggs of red ants are good material to cook. They are clean and high of protein nutrients. Red ants eat mango leaves so their bodies taste like a squirt of lime, but their fresh eggs are fatty and sweet, they resemble the soft fluffy ends of mini barley grains, or soft ‘rice bubbles’ and have a delicate taste, soft appealing texture and a slightly tart edge. I told her that I tried Koi Khai Mot Dang ( Spicy Raw Ant Eggs Salad) for the first time yesterday. I was afraid to eat it, my brain was imagining all sorts of unusual stuff, but I closed my eyes and had one bite because I wanted to know what it tasted like. It was so spicy that I couldn’t taste the eggs, I only felt juice came out when I chew them. She told me that Ant Eggs are also used in dishes like “แกงผักหวานไข่มดแดง Gaeng Pak Wan Kai Mot Daeng” (Red Ant Egg Soup with Sweet vegetable), or added to an omelet “ไข่เจียวไข่มด kai Jiow Kai Mot. 1. Knead all ingredients together gently. 2. Put the seasoning. Then add the remaining vegetables, stir until well combined. Serve with fresh vegetables. Another most adventurous dish I’ve eaten was cow’s brain. If you would like to try, see HERE where I tasted it. I tried a dish somewhere in Nakornpathom, the main ingredient is the red ant eggs soup cook with herbs. Taste really good. I finished few bowls. Thanks Mod for this wonderful story and the unusual recipe (even for you!). You have more guts than I do trying this dish. In the picture they actually look like larvae. I spent several months living on Soi sam-sip-sam, but never knew about this eatery. I was offered some fried grasshoppers (taktaeng) or crickets once when sitting in a bar in Jomtien. Not much different from fried potato chips: fatty and crunchy. At a friend’s hometown near Phimai they served minced rats for breakfast. I think they did it only to gross me out as no one there really ate much of it either. It was very spicy and I ate some in the name of ‘sanuk’.